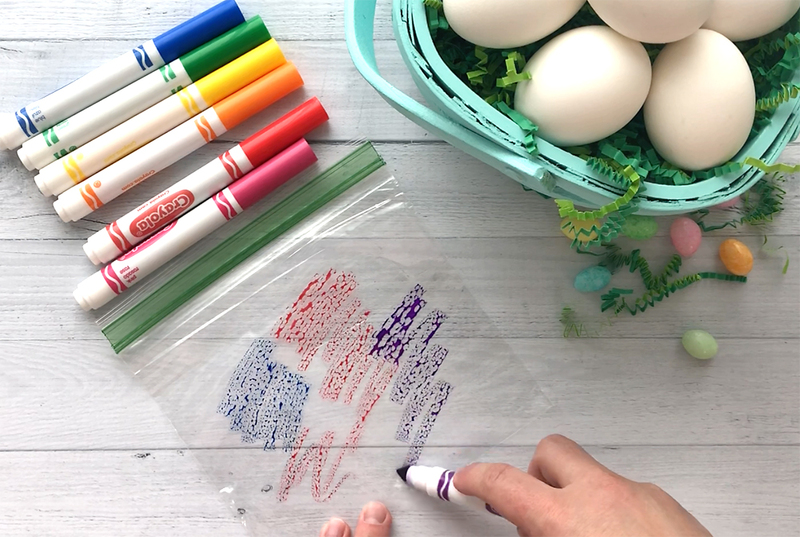 In today’s post: This crazy easy egg decorating idea for kids gives you beautiful watercolor Easter eggs using markers and a sandwich bag! I don’t like dyeing eggs. Well, let me amend that statement: I don’t like dyeing eggs with kids. It’s messy (cups full of DYE? whose idea was that?!?) and it’s actually kind of boring (dunk egg. wait. remove egg. dunk another. wait some more.). So every year I try to come up with a new way to dye eggs that’s both less messy and more fun than dunking eggs in dye. Last year the kids and I colored eggs with tissue paper, and the year before that we used tattoo paper to make floral Easter eggs. 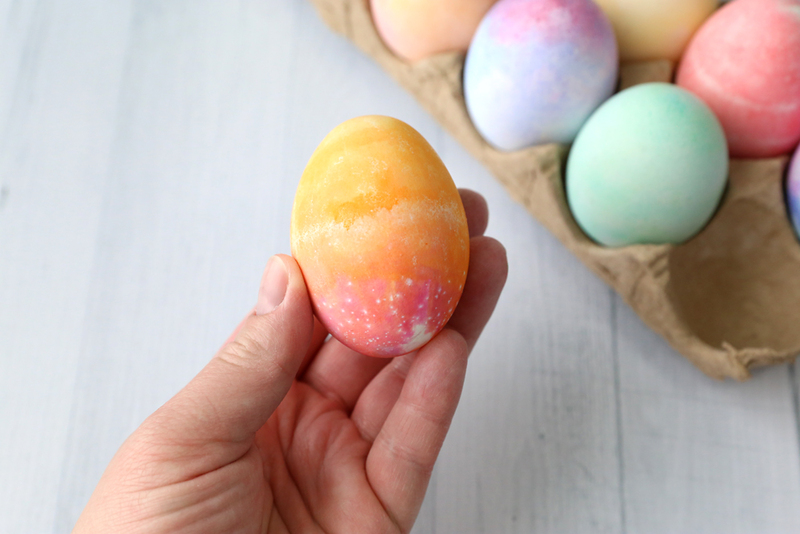 This year we made gorgeous watercolor eggs using markers and sandwich bags! Sounds a little weird, right? 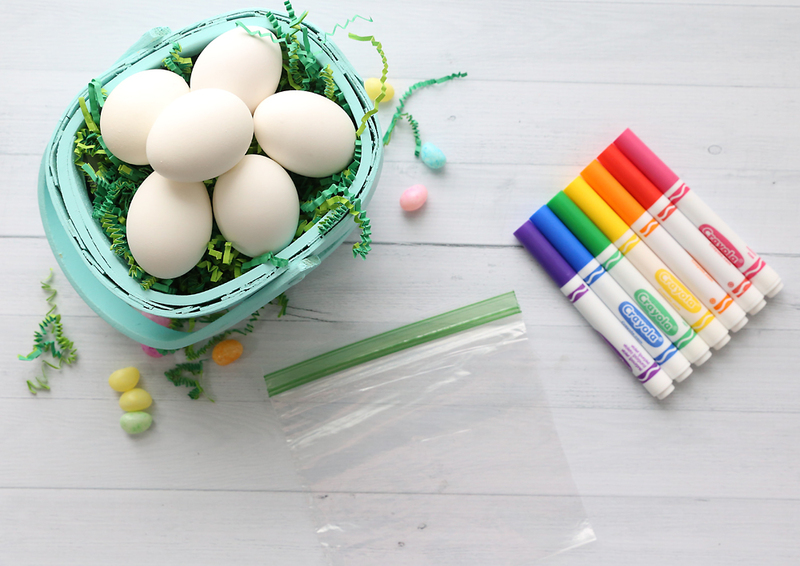 Yes, you can color eggs with markers and plastic sandwich bags! It’s fun because you get to play with color mixing and it’s easy enough for very young children. Here’s how it works. 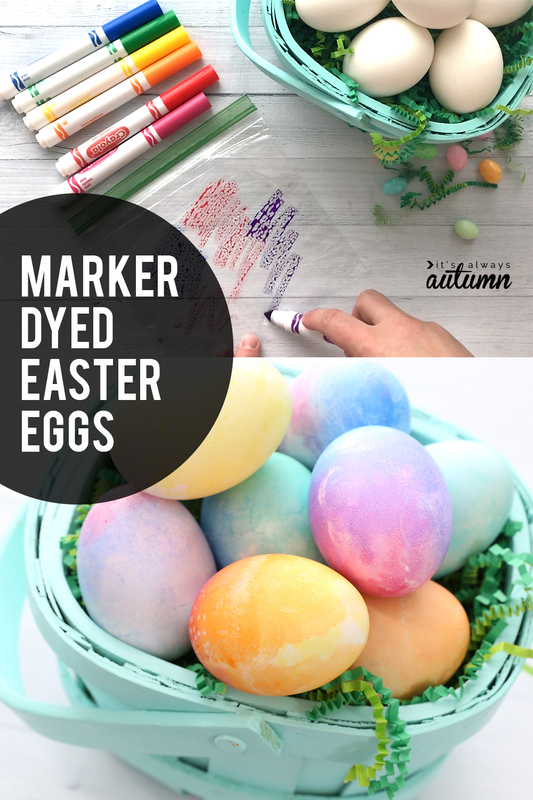 Grab some Crayola markers (just the classic markers, not washable ones) and a few ziplock sandwich bags. You’ll also need a cup of water and a stack of napkins. And eggs! We used hardboiled eggs, but you can also use craft eggs. Walmart sells a nice set of fake eggs that are completely recyclable for about $2/dozen. We tried this technique with some of those as well and it worked great. Start by coloring on the plastic sandwich bag. Just scribble a few different colors in splotches on the bag. Next, dip your egg in water to get it wet, then place it on the bag. Grab the corners of the bag and pull it up and around the egg. The water on the egg turns the marker ink into paint. Smoosh the egg around inside the bag to get color all over the egg. Then set it back down on the table and open up the bag. 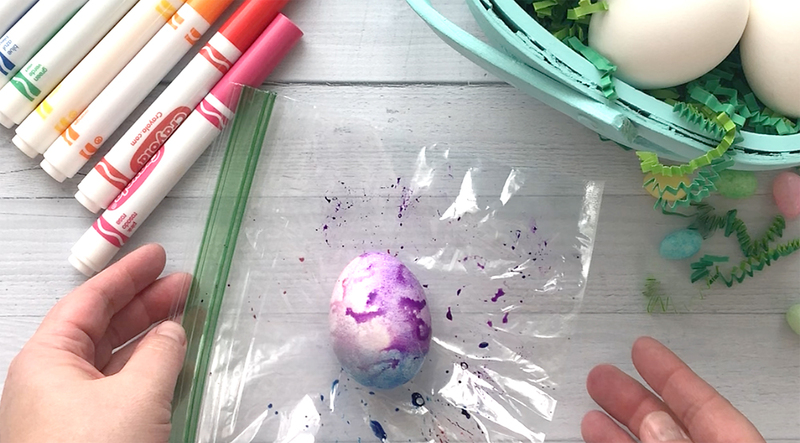 At this point, you can leave your colored egg on the bag and let it dry completely, OR you can pick it up with a napkin and dab it dry. We dried ours off with napkins so we didn’t have to wait. 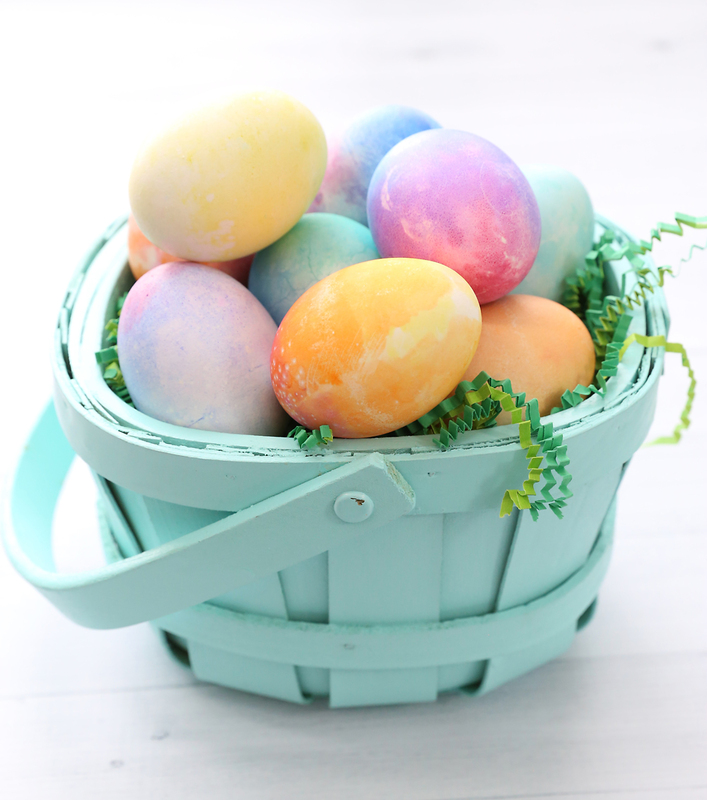 The napkin does absorb a little of the color, but plenty of color will remain on the eggs. 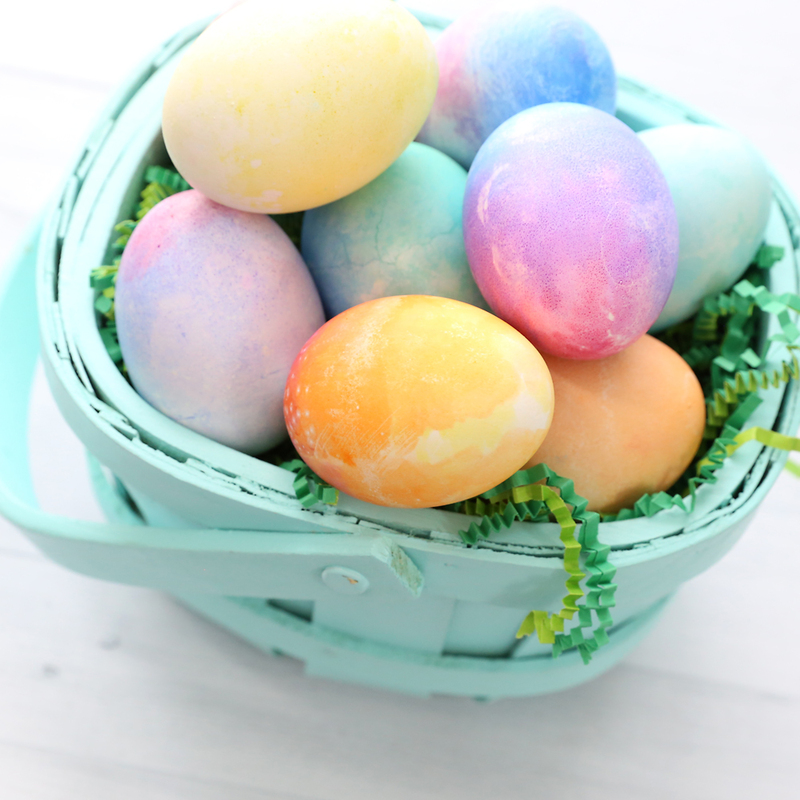 You can experiment with different color combinations to get different effects on your eggs. Just remember the colors are going to mix, so stick to colors that will look good together, like pink-purple-blue, or red-orange-yellow. Just two colors together works nicely, as well. The pretty turquoise egg in the photo above came from using blue and green markers. Just be sure to avoid any color combinations that will turn brown once they are mixed (like green + red). You can also experiment with how you color on the bag. 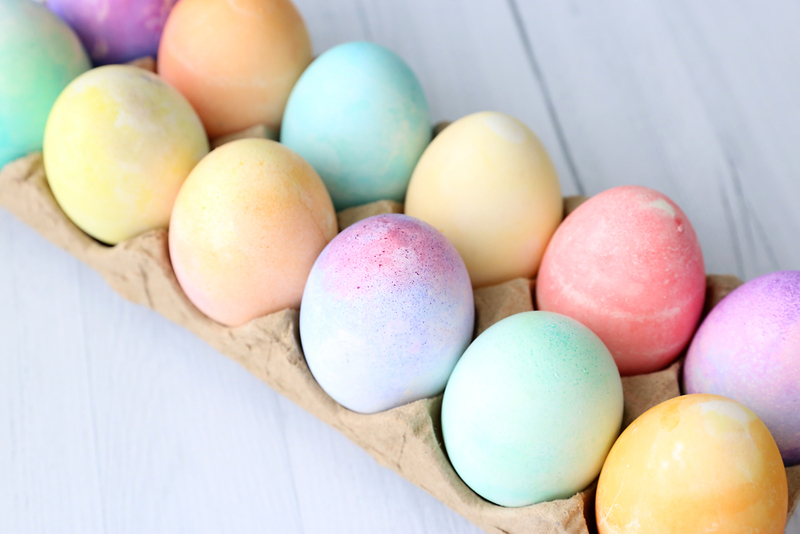 For most of our eggs we just colored in splotches, but for the egg above I colored a row of yellow on top, orange in the middle, and pink at the bottom. This technique is much tidier than using cups of dye, but you will still want to have paper towels or wipes handy because you’ll end up with some drops of “paint” on the bags that can stain fingers if you touch them. 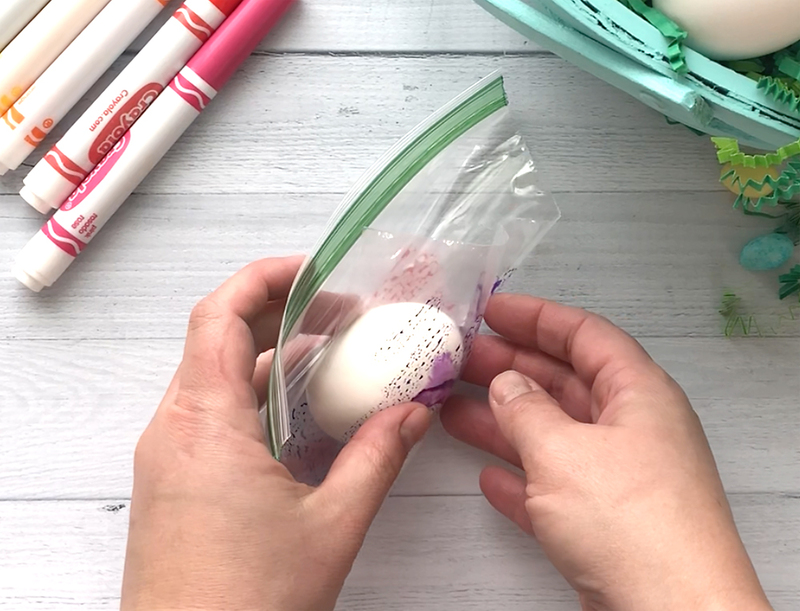 You can use a paper towel to wipe your bag clean and reuse it for each egg, or you can start with a new bag for each egg. 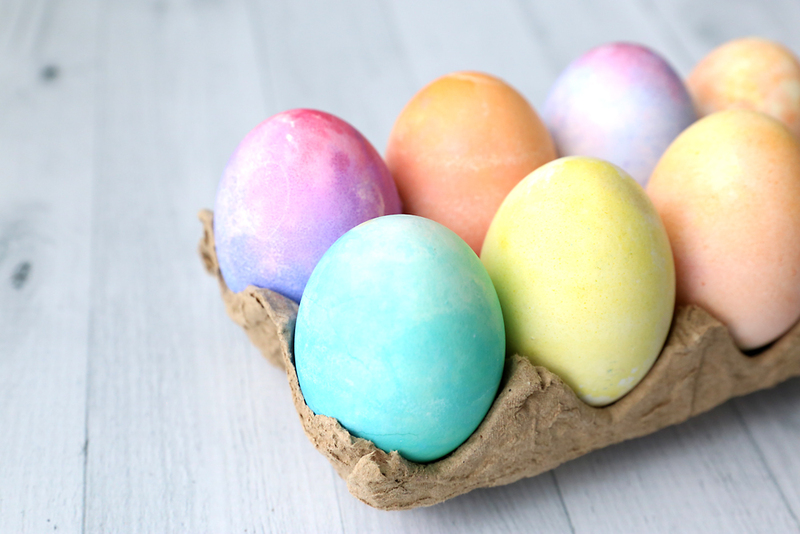 As far as color transfer goes, some of the color does seep through the eggshell onto the egg itself. If that means you won’t eat the eggs, you may want to stick to using the fake eggs I mentioned above. Happy Easter! 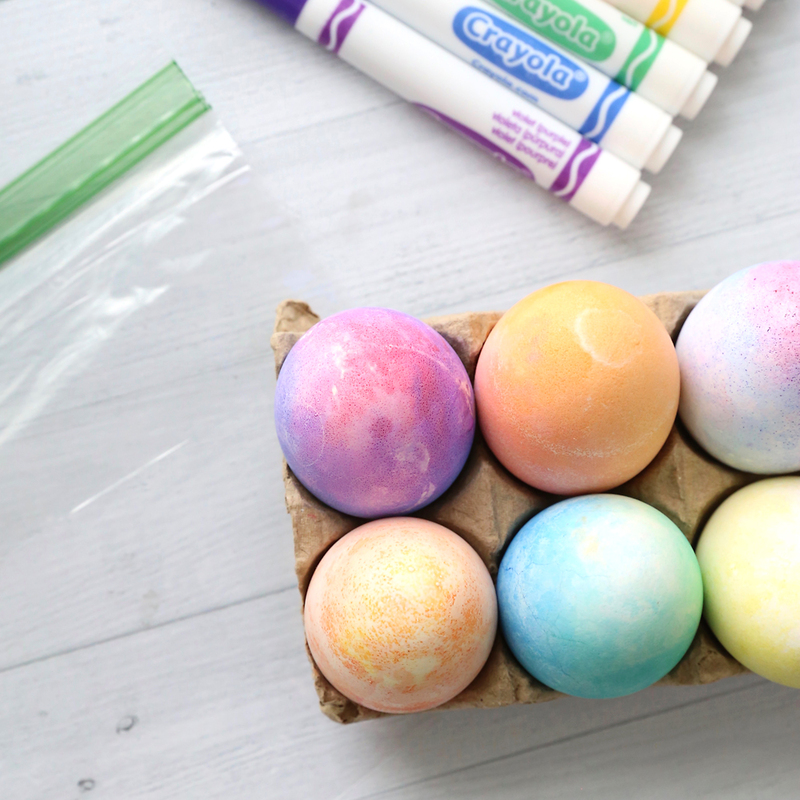 Hey, wondering what to do with all the hard boiled eggs you colored? Try making creamed eggs on toast! I love this idea! I can’t wait to try this out, thank you for the awesome content! Just tried it with plastic wrap, made 5 beautiful eggs in seconds. Using this with my grandsons and children’s church classes. Thanks!! I absolutely love this! Since I’m working with toddlers, I’m thinking I might try coloring INSIDE the bag, then putting in the egg and letting them smoosh it around. Thank you so much for this! What was the name of the eggs from Walmart, what are they made of?